Imagine if someone put up a screen wall at the Hollywood Bowl in Los Angeles, and allowed you free access to the interior. You’d feel like a star from the golden age of Hollywood musicals. Imagine now that you could do it every time you caught a train. Well, at one station in America, you can do just that. And because it’s America, hardly anybody does. America; the country that has fallen out of love with long distance train travel. Sure, there are thriving city-region train services in many locations. Sure, long distance train travel isn’t a practical proposition for journeys across a country the size of America. But there are intra and even inter-state journeys where trains ought to provide fast, convenient competition to short-haul airlines. Yet national passenger railway Amtrak provides only a skeleton service of a train or two a day on most of its routes, hamstrung by the need to negotiate passage along railroads primarily used for freight, and the lack of resources and backing to take a commercially competitive approach. Only on a few routes like the “high speed” Acela service between Boston and Washington D. C. (it runs at 150mph which isn’t high speed by mainland European standards) has Amtrak succeeded in getting people to take long distance train travel seriously. Most Americans look at you as if you’ve gone mad when you tell them you’re travelling anywhere by Amtrak. And so they miss using some of the most amazing railway stations in the world. America is a big country. Amtrak’s trains, infrequent though they are, are staggeringly long and incredibly tall, with carriages much taller than anything in Europe. America’s big city railway stations are, if anything, even bigger on style, impact and charm. But many of them are virtually a secret within their own country. 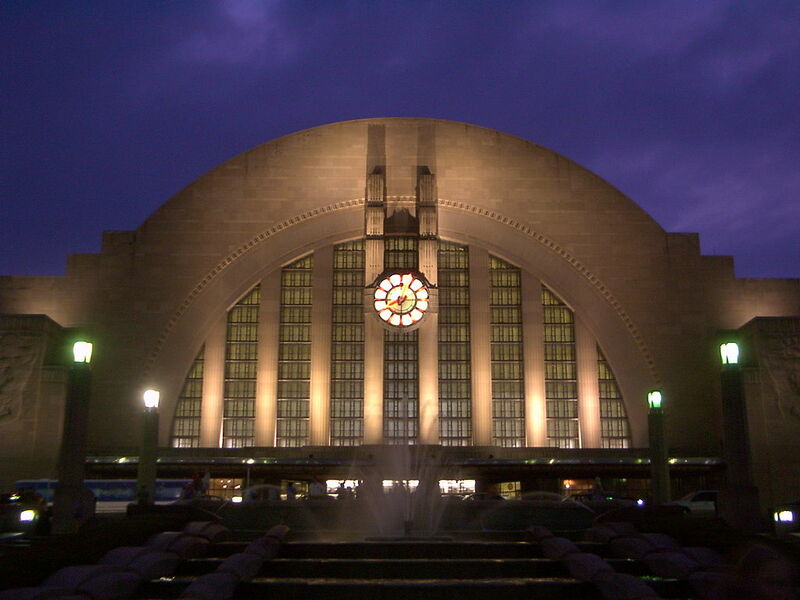 So it is with Cincinnati Union Terminal in Ohio, one of Cincinnati’s foremost landmarks. This Art Deco masterpiece is actually a shadow of its former self. But what a shadow. The lady might be past her prime, but she’s still got the glamour of a lost world. From the outside, the station looks like an enormous bakelite radiogram from the heyday of Art Deco, a giant semicircular limestone facade with vertical windows forming an ostentatious lunette well over two-thirds the height of the entire building, which is 10 stories high. 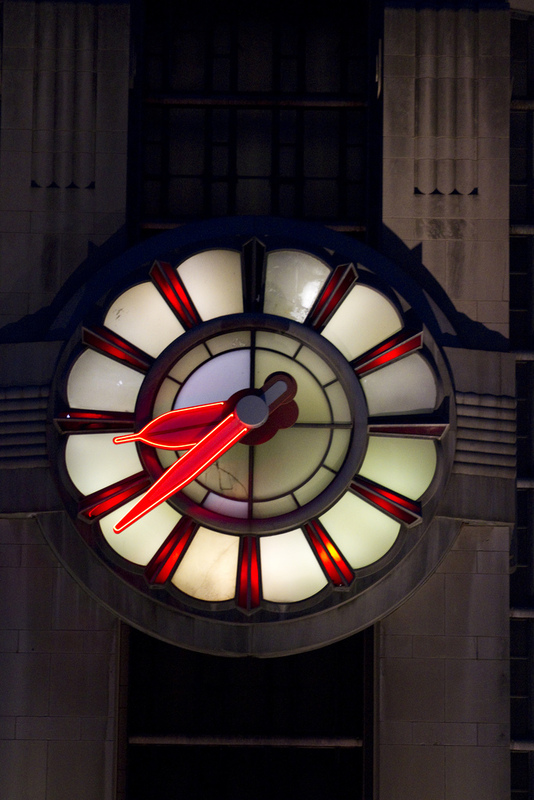 A beautiful Art Deco clock, the radio’s on/off switch, is supported on a pair of stepped pilasters which run down the middle of the facade. Two giant freezes by Maxfield Keck, depicting commerce and transport, relieve massive stepped buttresses which bookend the main building. On either side are curved wings, articulated with more pilasters and recessed windows. At the front of the building, illuminated by some of the most stylish lighting columns you will ever see, is a drop-off/pick-up loop of roadway, and in the middle of it is a cascade, also of lovely Art Deco detail, with scallop-edge steps and billowing limestone blocks. 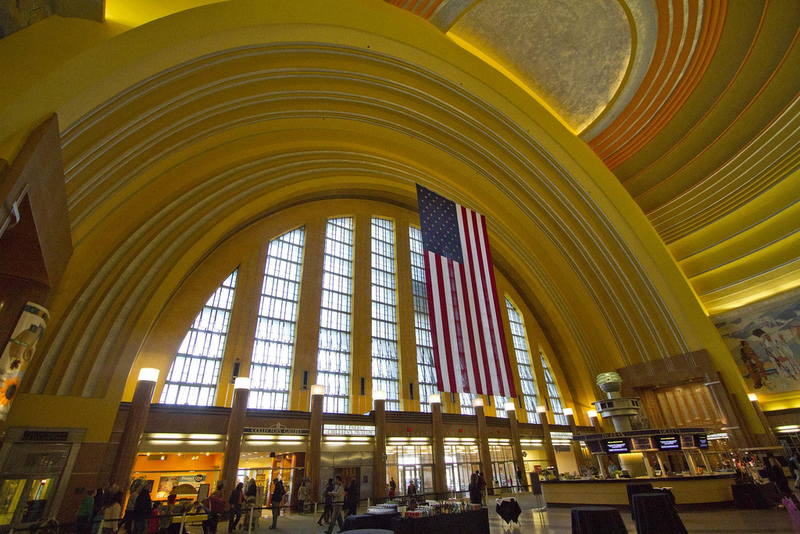 This is Cincinnati Union Terminal’s ‘rotunda’, the largest half-dome in the western hemisphere. There used to be a long concourse running out over the railroad tracks and platforms behind it, also of significant architectural interest, but now the rotunda and its side wings are the only part of the building which is left. Cincinnati Union Terminal opened in 1933, to the design of Alfred T. Fellheimer (1875-1959) (who was also lead architect for New York Grand Central) and Steward Wagner, though French architect Paul Cret was responsible for many of the station’s notable Art Deco features¹. 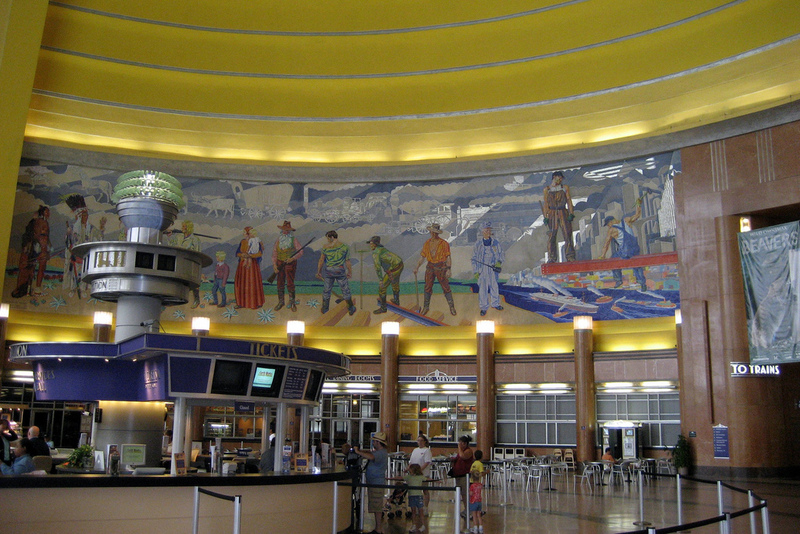 The building was decorated throughout the rotunda and main concourse with mosaic murals by German artist Winold Reiss (1886-1953), showing America’s cultural heritage. Further murals were commissioned from French artist Pierre Bourdelle for the public rooms, including restaurants and restrooms, and these took somewhat more fanciful and fantastical approaches. 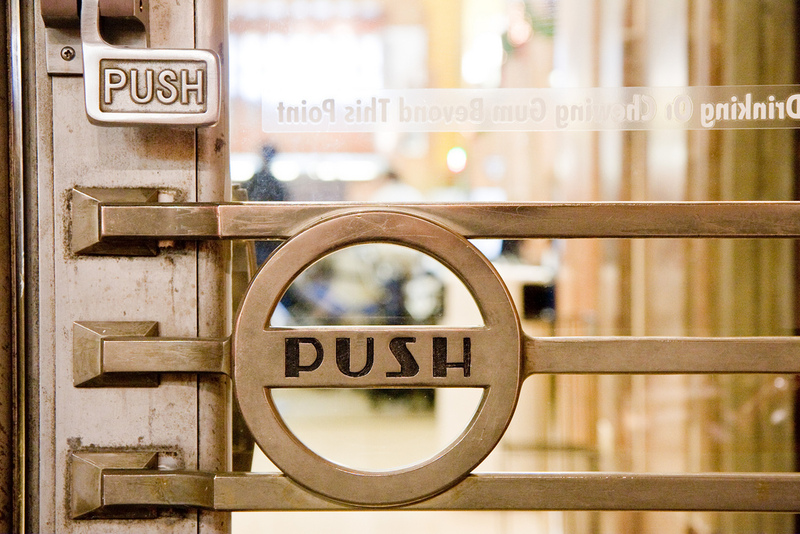 The internal rooms of the station were themselves chock full of Art Deco / Streamline Moderne details with fluting, curved panelling, shiny metalwork and geometric floor patterning all over the place. Not only was the building the host of significant works of public art, but it has had a wider impact on culture too. It appears, virtually unmodified, as the headquarters of the Justice League of superheroes in comic strips published by DC Comics. Opened during the Great Depression, passenger numbers at Cincinnati Union Terminal weren’t what had been hoped, and from the moment it opened, some believed the terminal was a white elephant. Passenger numbers picked up significantly during World War II thanks to troop movements, but afterwards fell again, and continued to do decline in subsequent years. Long distance passenger travel in America moved to the roads and airlines. By 1972, there were only two trains a day at the terminal, and Amtrak gave up serving the station in favour of alternative facilities in Cincinnati. The concourse, which sat over the railroad tracks, was demolished so that freight train operators had enough vertical space to run taller piggyback trains. Most (but not all) of Reiss’s murals were saved and relocated. The rotunda (which housed two of Reiss’s murals) and its side wings were the only part of the station building which survived, to show what the rest of the station must have been like. In a word, incredible. Attempts to convert the now-redundant station into a shopping mall failed, and there was a danger that what was left of the station would be lost. They might not use the trains anymore, but local residents liked the building enough to pass a bond levy issue in 1986, the funds from which were used to preserve the station and ensure its re-use as the Cincinnati Museum Center. The surviving part of the station is now easily enjoyed, as it hosts several museums including a history museum and a science museum. The Cincinnati Railroad Club has its facilities in one of the high-up parts of the building. From there, along with the other museums, they can keep a watchful eye on this most beautiful of stations, the greatest exhibit the museums have in their collections. 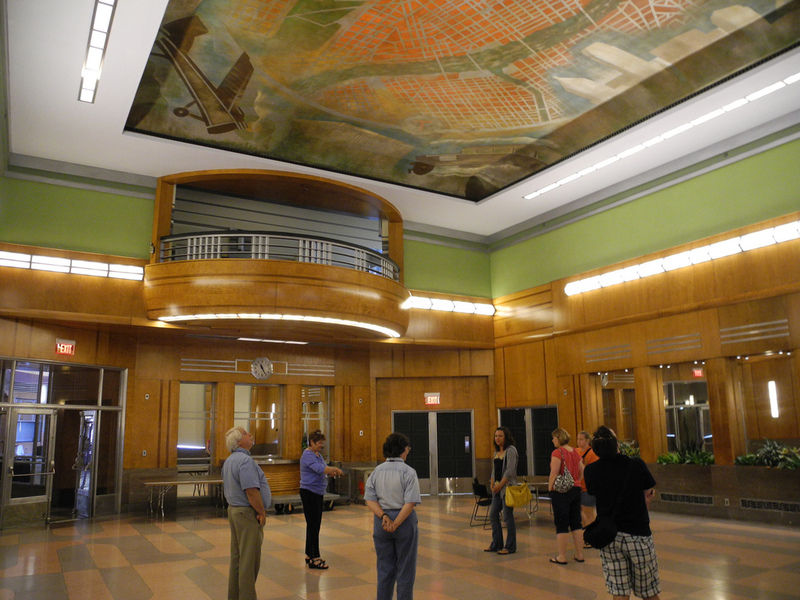 The Museum Center runs regular tours of the building, where the remaining murals and eye-popping architecture can be appreciated. You can even (you mad thing, you) catch a train there. Thanks to the restoration efforts of the terminal’s new owners, Amtrak restored passenger services in 1991. But you wouldn’t have a lot of company. In 2012, Amtrak’s service of three trains a day provided boardings plus alightings of 16,209 passengers. That’s an average of 44 passengers per day. The station was designed to handle more passengers than it currently handles per year…in a single day. Never has so much great railway architecture been enjoyed by so few passengers, except perhaps at other American stations. The green arrow marks the location of the terminal. 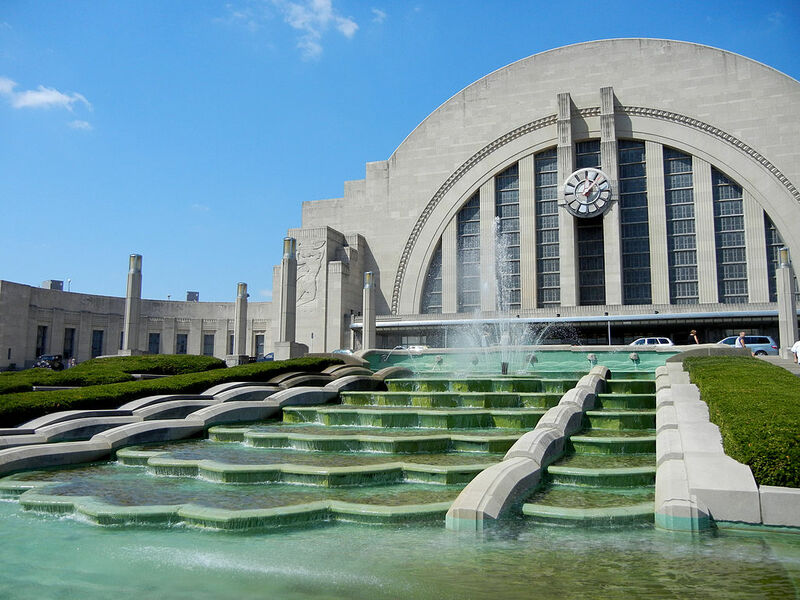 Cincinnati Museum Center’s comprehensive history of Cincinnati Union Terminal, its art, its decline and its restoration, here (without which this entry couldn’t have been written, so thank you).